Pascal's Triangle: A simplified version of the binomial theorem. Pascal's triangle is a simplified version of the binomial theorem. 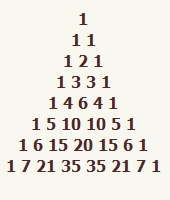 Pascal's triangle starts at row 1 with the number 1. The second row contains two numbers: 1 and 1. In each iteration, adjacent values are added together to make the number for the next iteration. Click on figure 1 to see the algorithm for building a Pascal's triangle. Figure 1 contains the first eight iterations of Pascal's triangle. Click on the image to see how the triangle is constructed. 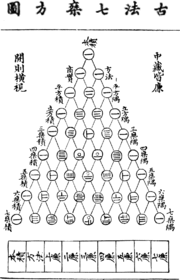 Figure 2: Yang Hui triangle published in 1303 by Zhu Shijie. Click on the image to see a larger version. Pascal's triangle in the western world is named for the French mathematician Blaise Pascal. However, it was studied earlier in India, Persia, China, and Italy. See figure 2. The sum of the numbers of each row is twice that of the previous row. The first number after the 1 in each row evenly divides all the other numbers if and only if the first number after the 1 is a prime number. 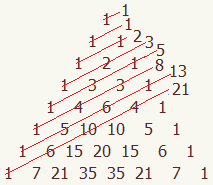 The 'shallow diagonals' of Pascal's triangle add up to the Fibonacci numbers. See figure 3.
where n is the row number and r is the column in the row. McAdams, David E. Pascal's Triangle . 12/21/2018. All Math Words Encyclopedia. Life is a Story Problem LLC. http://www.allmathwords.org/en/p/pascalstriangle.html. Yang Hui triangle published in 1303: Zhu Shijie, https://en.wikipedia.org. This work is in the public domain in its country of origin and other countries and areas where the copyright term is the author's life plus 100 years or less. https://en.wikipedia.org/wiki/File:Yanghui_triangle.gif.